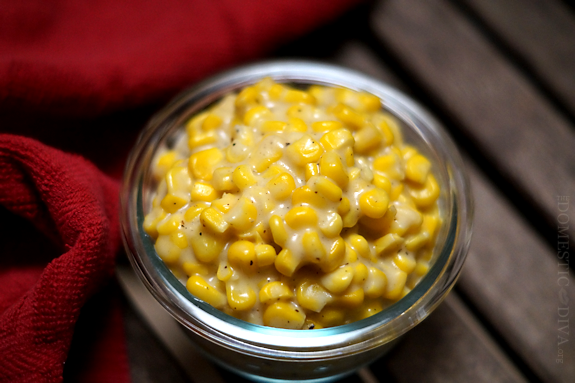 There is no better southern side dish than creamed corn. Ditch that canned stuff, you won’t believe how easy it is to make this side dish from scratch. Besides, we all know that homemade tastes so much better! Many nights when I’m not serving southern style sweet cornbread, I will serve this southern inspired creamed corn recipe instead. 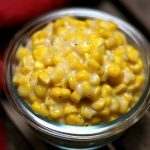 Gracing my southern table right next to a big tall glass of Southern Sweet Iced Tea, creamed corn is a frequently made side dish around these parts. I love creamed corn, and have since I was a kid. This recipe is quick to make and goes well with many main dishes. Creamed corn like you've never had before. This creamed corn recipe is sure to be a hit at your next family gathering. It's quick, simple, and delicious. Make ahead or the day of. This recipe reheats well and is great for leftovers if there are any. Melt butter over med-high heat in a medium saucepan. Stir in flour and cook for about 2 mins. Stir in milk until combined with the flour mixture. Add in frozen corn, salt, pepper, and sugar. Stirring frequently to prevent burning, bring up to a low boil. Cover and reduce heat to medium. Cook for 10 mins, stirring every few minutes. Did you like this recipe? If so you’ll love our other southern recipes like learning the secret to the best southern cheese grits in Georgia and you won’t believe how easy it is to make hot boiled peanuts in a crockpot! My husband loves creamed corn! & this looks yummy, not to mention simple. Definitely going to make it for him soon since I have a ton of corn. Thanks – I loved this as a kid. I did not know it’s so easy to make! I like creamed corn, but it can definitely get boring.. Thanks for this recipe it can change it up a bit. I never thought to make my own, thanks for sharing! 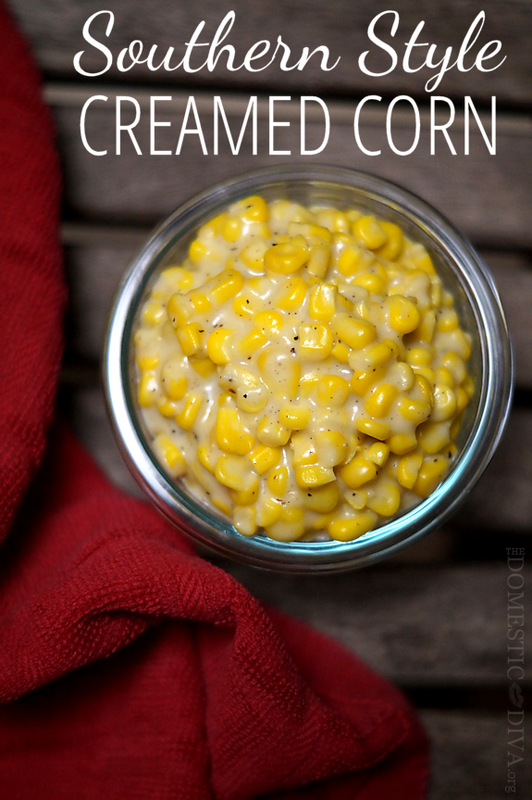 I love creamed corn and would love to try the homemade version! Thanks for sharing this recipe. It looks delicious. This sounds so good! I might try this for Easter as one of my sides. Thanks for posting! This sounds so good! Can I use fresh corn instead of frozen? Turned out amazing, this will be my go to for HM creamed corn yay! I’m so glad it turned out great for you. Thanks for coming back and commenting! How many people can this recipe feed? About 6, maybe a little more or less depending on “serving size”. Could you use half & half instead of milk? Or will it not thicken up enough? I’m not entirely sure as I have never tried this recipe using half & half instead of milk. I would think that it may become too thick but if it does you could thin it out with a little water. Excellent recipe! I did go ahead and skip the sugar and I did puree a little of the corn to make it more creamy. MMMMMM good! A dear friend of mine used to make fried corn in the summer. It was similar to, but not the same as creamed corn. Either way, I love them both! This was one of my side dishes tonight for supper. I also had pinto beans with a nice piece of smoked ham hock, fried okra and a creamy cucumber, onion and tomato salad. Of course being a Southern Boy, we had to have sweet tea and cornbread. BUT this Cream Corn stole the SHOW. It was completely devoured and I was informed it could be a stable from now on!!!! Oh WOW! That is awesome. Thank you SO much for coming back and taking the time to comment. I am so glad everyone enjoyed it. Your dinner sounds delicious! I’ve made this in the past, yum! Any thoughts about making this ahead for Thanksgiving. I do think this could be made ahead of time. From my experience it reheats just fine and is great for leftovers. This recipe was so delicious. I have tried for years to duplicate my mom’s recipe, I do believe This is it. Thanks for sharing.